CHICAGO — Carrier Logistics Inc., a provider of management software for less-than-truckload operations, has transitioned to new leadership and is exploring opportunities to add deeper data analytics and artificial intelligence. The Tarrytown, N.Y.-based software firm has appointed longtime executive Ben Wiesen president, succeeding the retired Don Adams, who co-founded CLI in 1972 along with the late Ken Weinberg. Wiesen, who was CLI’s vice president of products and services, joined the company in 1995 as a transportation consultant. He became president when Adams retired Sept. 20. CLI also has promoted Kevin Linardic to chief technology officer. Linardic was vice president of technology at the company. CLI customers can expect a “seamless transition” under the new leadership, Wiesen said at the company’s annual user group conference, held here Oct. 4-5. “We want to extend the legacy of what Don and Ken created, and we know we have a lot of hard work in front of us as well,” Wiesen said. During the meeting, CLI paid tribute to Weinberg, who died in March 2017. Wiesen described Weinberg as not just a company leader and industry expert, but a mentor and a good friend. Moving forward, CLI will continue to refine its flagship FACTS system while looking at ways to provide additional capabilities on top of that core product, Wiesen said. FACTS will remain an “open system” that will integrate with a variety of third-party technologies, ranging from the “revolutionary” to the “blocking and tackling of trucking,” he added. 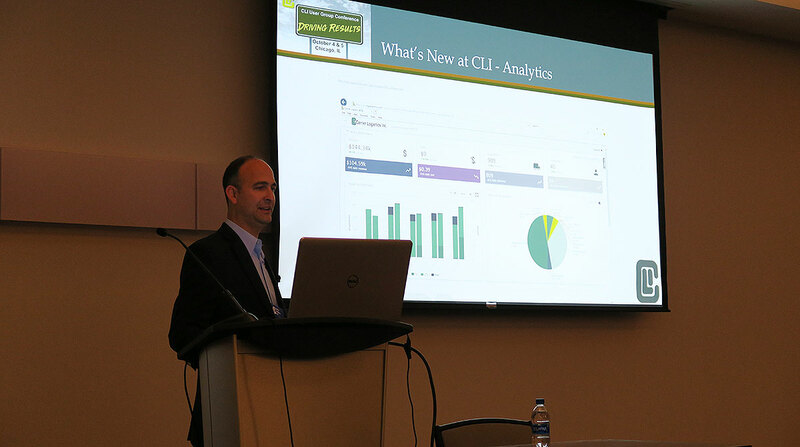 Looking ahead, a major initiative for CLI will be to offer more management reporting, key performance indicators and data analytics, including dashboards, graphs and visualizations to help fleet managers better understand what’s happening in their business. Another near-term special project is to introduce dynamic pricing for some LTL freight. The goal, Wiesen said, is to give fleets the ability to configure their system so that certain customers receive dynamic spot quotes based on market conditions, similar to booking airline tickets or a hotel room, instead of a static, fixed rate. To implement that capability, CLI has partnered with SMC3 to incorporate its Cost Intelligence System, a freight-costing tool. For example, AI could help fleets make better decisions on which shipments they should inspect or audit based on what the system knows about the fleet’s network and its customers. Ultimately, CLI will set its course in consultation with its fleet customers. In an interview with Transport Topics, Wiesen reflected on how technology adoption has changed the trucking industry since he joined CLI more than two decades ago. While the industry’s mission hasn’t changed, computers now play a major role in it, enabling fleets to manage each shipment and customer while analyzing trends and optimizing their businesses. “Trucking really started to increase the science of doing this simple-sounding job that becomes very complex to do effectively and efficiently,” Wiesen said. Prior to joining CLI, Wiesen was an operations engineer for Roadway Express, where he was responsible for re-engineering satellite facilities. While studying factors such as loading and unloading times and dock door design, Wiesen saw the potential for technology to improve trucking operations. “I realized that none of that stuff could happen effectively without computer systems,” he said.